Competed at Ironman Cairns today. Tough field and tough conditions. Won! Finally! Asia-Pacific Champion and now third on the world ranking. Absolutely stoked! For a little bit of nostalgia, here’s a my 2008 Ironman Western Australia race report. Some people think that the life of a pro athlete involves just turning up on the day and racing, but in reality there’s quite a bit more to it than that. Media interviews, sponsor commitments and making time to put something back into the sport are all part of what we do. Pre-race at Cairns I had the usual media stuff, but on Thursday night I had the privilege of speaking to a bunch of athletes from the Australian Defence Forces who were all competing in the IM or the 70.3. There were about 30 of them. I spoke a bit about what I do, what I’ve accomplished, my training and some stuff about diet – what works and what doesn’t. I shared a few insights about what it’s like to do elite IM and threw in some humour to lighten the mood. Then they grilled me with a stack of questions. It’s funny – like most people I’m a bit shy when it comes to public speaking, but I really enjoyed talking about a subject that I’m passionate about. I had a great time with the ADF athletes and just want to acknowledge the amazing contribution they, and all our defence force personnel, make to our country. Friday it was time for the Pro Panel and then Saturday I did a little bit of training – just enough to keep light and fresh. Conditions on the day were challenging to say the least and the wet and windy weather definitely contributed to some carnage on the bike leg – both Luke McKenzie and Jordan Rapp punctured and Matt Hansen crashed early on. Todd Skipworth went down just in front of me and I nearly lost it twice myself. The wind also whipped up the chop for the swim. I got a good start in the swim though and was in the lead group with ten others for the first lap. Thank goodness us Aussies are brought up swimming in the surf! In the end the first ten guys out of the water were all Australians, which says a lot. Hanson and Rapp from the USA were really struggling with the conditions. When we started the second lap we were overtaking a lot of age-groupers on their first lap and things got really congested. Because it was rough and there were people everywhere, I lost contact with the lead group and ended up swimming on my own. I lost almost a minute, which wasn’t a lot, but it was just enough of a gap to be a concern. Luke McKenzie came out of the water in 46:28, with Clayto (Clayton Fettell) hot on his heels. I was 58 seconds behind Luke – not bad given the chaos in the water. For what it’s worth, the bike course for IM Cairns is definitely one of the most scenic in the world. Heading up the Captain Cook Highway towards Port Douglas is just spectacular with Pacific Ocean views on one side and tropical rainforest to ride through. Combine that with enough hills to make it interesting and you’ve got a great course. Mind you, throw in rain and wind and that increases the challenge factor significantly. Out on the bike, I quickly caught up to the chase group. It was pouring with rain and by that stage Luke McKenzie, Clayto and Pete Jacobs had already cleared out. At the 18km mark, heading up towards Dudleys Knob, the three leaders had 1:30 on us. By the turn at Port Douglas at 44km, McKenzie was 37 seconds ahead of Clayto and Jacobs and the chase group had spread out. I had been riding with the group, but by this stage I’d been riding off the front for a bit. I was 2:48 off the pace and felt like I was kind of stuck in no man’s land. At about 65km, Cameron Wurf and Todd Skipworth made a big move. Wurf was definitely motoring. At the 82km turnaround, Wurf was two minutes off the front and Todd and I were another three minutes back. I could tell we were losing ground on the leaders – by 108km we were 6:26 down and that lead was increasing. I had no idea what was happening up ahead, but the drama was playing out with Luke McKenzie’s puncture taking him out, Wurf moving into second place behind Clayto and Jacobs staying solidly in third. Clayto exited T2 with over six minutes on Wurf and with 10:40 on McKenzie. When it came down to the bike times, there’s no doubt Clayto absolutely destroyed the bike leg with a blistering 4:23:53. 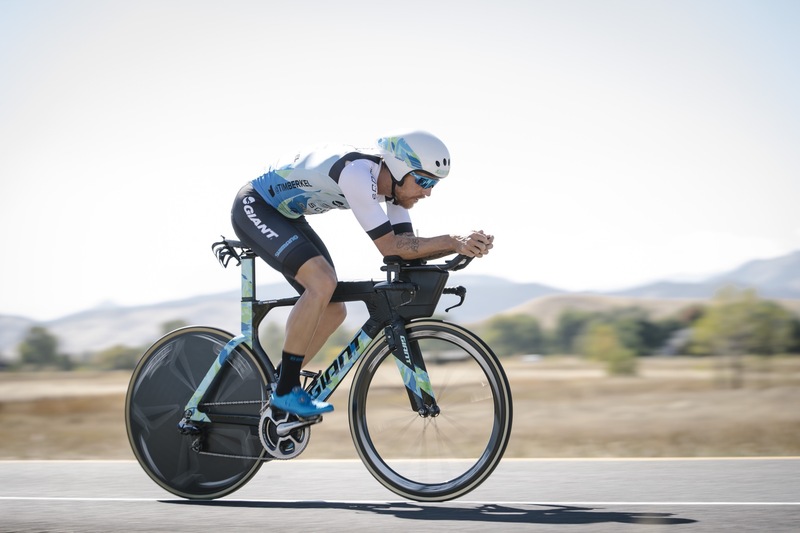 Cam Wurf, coming from a pro cycling background and competing in triathlon for the first time as a professional finished the bike in 4:23:59. Meanwhile… I was hanging in there on the bike. I definitely wasn’t having as strong a bike leg as I did in IM South Africa. I couldn’t wait to get off the bike and start reeling those leaders in! When I came into T2 and got the split – 14:01, I thought, “Holy Sh*@! I’ve got some work to do!” But once I started running I felt really good. I got into my rhythm quickly and then just started chipping at that lead. Then I saw how close Pete was and how close Luke was, so I just ticked away. I picked up Pete first and then Cam Wurf. By the 16km mark I was in third place, 6 minutes back from Clayto and with Luke McKenzie in my sights. And I was flying. I finally took the lead from Clayto around the halfway point and that felt really good. After that, I didn’t look back. I knew Dave Dellow was behind me and at one stage I was a little concerned. At 28km Dave had closed the gap to about 1:50 and I was going through a rough patch. But there was no way I was going to let this race go. It was not going to be another second! I just dug deep and worked through it. I was still staying relaxed and keeping my form, cranking out the kilometres at 4:28 pace. Dave couldn’t keep up and I heard after the race that he’d struggled with some cramps in the later stages. I know from my experience at Kona just how bad that can be. In the end I won in 8:15:03, 4:10 ahead of Dave Dellow and 13:25 in front of Pete Jacobs. 2:46:31 gave me the fastest run time on the day, which I was also happy about. I was absolutely over the moon as I ran up the chute. Maybe if I’d spent less time high-fiving the crowd I might have shaved more time off Dellow’s course record, but a second is a second and I’m really happy with that! I’m looking forward to taking the next couple of weeks off and doing nothing. Zero! Then it’s back to Boulder to start my prep. The Asia-Pacific 70.3 Championships in Cebu are on the radar and then it’s Kona. Bring it on!